The NTA got the chance to sit down with the lovely Alison Marras, NTC of Food By Mars. Alison is a Certified Health Coach and went on to take our Nutritional Therapy Consultant program in 2018. Alison curates a website full of nutrient dense recipes, health related articles, and one-on-one consulting opportunities. She specializes in PCOS & hormonal imbalance, painful and irregular menstruation, autoimmune diseases, hypothyroid & hyperthyroid, adrenal fatigue, and so much more. 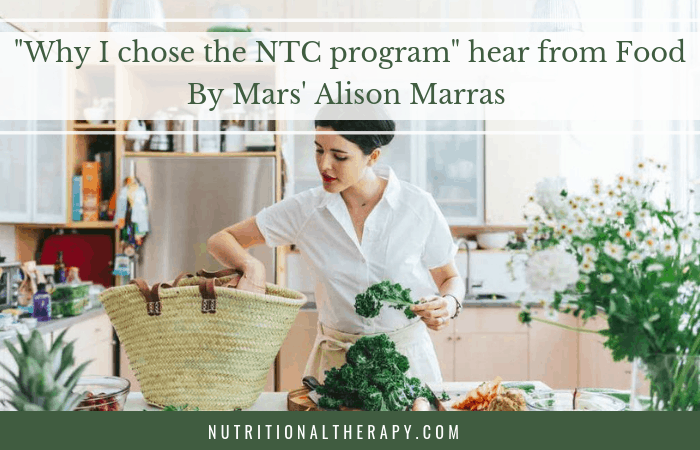 While you are contemplating if the NTC program is right for you, we think you should consider some of the many reasons why Alison Marras chose this program for her certification. Most of my clients are remote and I knew they would be, so having the hands-on portion that the NTP curriculum covers wasn’t a requirement for my practice. I’m also known for recipes and that’s how most of my clients find me, so they’re big on wanting meal plans, etc. and help with gaining more confidence in the kitchen. But I really wanted to be able to educate them more on what the food is doing to their bodies and why they’d want to make smarter, nutrient-dense decisions on the food they consume. One of the best things about the NTA is the amazing, tight-knit community, and the fact that I was able to help myself in my own healing journey on a deeper level through learning this curriculum. I no longer get overwhelmed by symptoms, and have a strong system for prioritizing what area to begin with in order to heal at a deeper level. I use the entire Nutri-q, client questionnaire process as taught to us. I even guide my remote clients through Coca’s pulse test and sometimes other tests as needed. It’s brought immense value to my clients and to how I’m able to help them. Students also have free access to Modernmeal, a meal plan creation & nutritional analysis tool for use with clients. And Nutri-Q, a cloud-based Nutritional Assessment Questionnaire software. Interested in becoming a Nutritional Therapy Consultant?